Tim and I are very excited to have been asked to participate in Kelly Mitchelmore’s 6th annual art show in Windsor, NS this May. Kelly is a fantastic painter whose bright and bold paintings have drawn my eye wherever I’ve seen them. In addition to her own paintings, the show will feature the metal sculptures of Al Simm, and the creative wood carvings of Elizabeth Brown. We’re so honoured to be included in this great local lineup. This year’s theme is “Along the Avon,” and we’ve been thinking about what sorts of pieces we can make with fused glass that tie in to that theme. We’ve got a few things underway, and are hoping to have time to play a little more before the show. 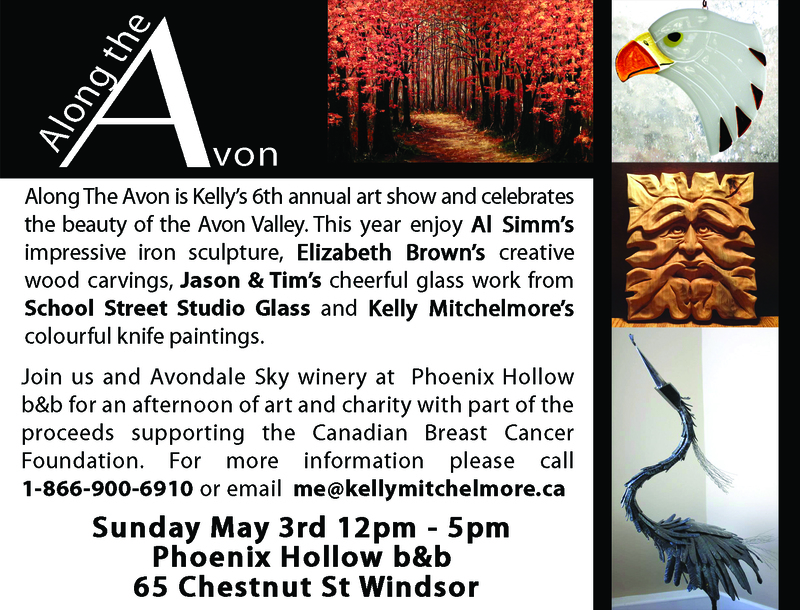 The show will be held at the Phoenix Hollow B&B on Chestnut Street in Windsor. The date is Sunday, May 3 from 12-5pm. If you’re in the area, you should definitely drop by.